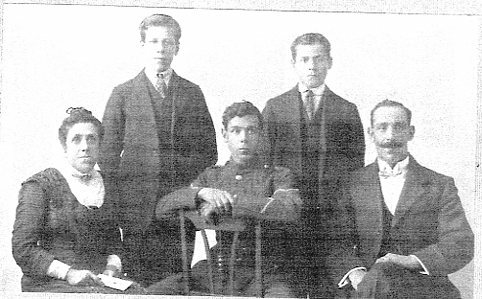 His elder brothers were either working or in the Army so it seems probable that his Mother, Hannah, couldn't afford to have him living at Southam Street which is why he was in the Kensington and Chelsea Workhouse School on the 1911 census. According to his daughter T, he ran away at some point and, like his brothers, Alf and Frank, joined the Kings Own Yorkshire Light Infantry (KOYLI) in WW1. I need to clarify with T the sequence of events. At what stage did George run away ? Was he already in the workhouse ? When was the photo taken with him in uniform ? Before or after WW1 ? He lost his leg and was shipped home. He married Theresa Agnes HUGHES on 31 May 1919 at Our Lady of Willesden Church, Harlesden and they had two sons Gerald 1920 and Godfrey 1922 and a daughter, T.
He signed up again and was a Major with the Royal Army Pay Corps in WW2. He died on 10 June 1945 from pneumonia after having an operation for a duodenal ulcer. Over the three years preceding his death, he also lost both his sons, Gerald and Godfrey, who were killed in action in WW2 while serving with the RAF. Gerald Eugene MUSGROVE (right) was born on 3rd September 1920. He joined the RAF Volunteer Reserve and started flying in December 1938. In December 1941 he was promoted to Flying Officer and stationed at Colerne. He was posted to 246 squadron Predannack, Cornwall and was hoping to return to Colerne in 3 months. Unfortunately he was killed aged just 21 on 22nd February 1942 when he collided with an Army Lysander over Totnes. Evidently there was no liaison between the two airfields ! Godfrey Dennis MUSGROVE or Bobby (left) was born on 3rd February 1922. 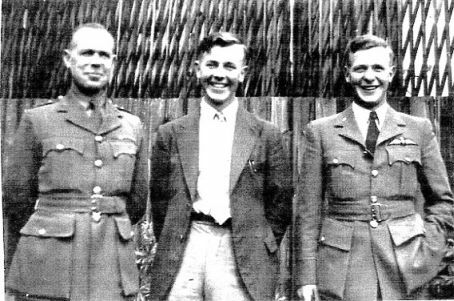 He joined the RAF after Gerald was killed and was stationed at Stormy Down, Glamorgan as an AC2. He was diagnosed with leukaemia and died aged just 22 in the RAF hospital St Athan on 18th October 1944. Son of Maj. George Henry Musgrove, D.C.M., R.A.P.C. (died on active service 10th June, 1945), and of Theresa Agnes Musgrove, of Harlesden, Middlesex. Aircraftman 1st Class GEOFFREY DENNIS MUSGROVE Have they got his name wrong ? Son of Maj. George Henry Musgrove, D.C.M., R.A.P.C. (died on active service 10th June, 1945), and Theresa Agnes Musgrove, of Harlesden, Middlesex. Son of William and Hannah Musgrove; husband of Theresa Agnes Musgrove, of Harlesden, Middlesex.